I'm one of the moderators (ListMom) of an OldTools email list. This year, a bunch of the galoots on the list got together and had planemaker Wayne Anderson build me and the other ListMom a chariot plane. 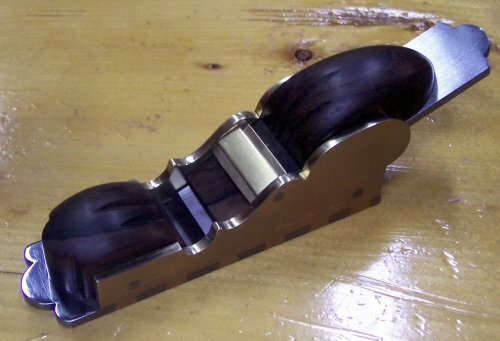 The plane is absolutely gorgeous, with brass sides perfectly dovetailed into the steel bottom, and some sort of tropical hardwood that holds the iron perfectly. It's a bevel-up plane, and in my initial, ahem, testing, it handles the toughest grain I had to throw at it. Click on the images for a larger view. In the side shot you can see Wayne's signature, as well as the microscopically tight mouth on the plane. And if that wasn't enough, the left over money went into a Lee Valley gift certificate. I've already got a shoulder plane and a couple books on the way. Thanks to everyone on the list for their generosity. It's a great list, with great folk. If you're at all interested in working wood by hand, or in collecting old hand tools, check it out. On this week's America's Test Kitchen the gadget guy demonstrated a device that cores, peels, and slices pineapples. The Cooks Illustrated review says that using a knife and carving the pineapple manually does yield more fruit (31 vs. 24 ounces of a 64 ounce pineapple), but this gadget makes it incredibly simple. 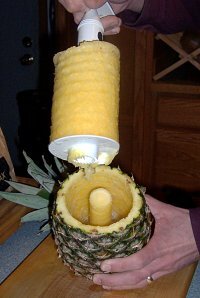 The whole process took less than five minutes, required virtually no skill, and I got a whole bunch of pineapple slices to eat for lunch. According to my nutrition software, a single slice or raw pineapple contains 79% of your daily value of vitamin C, 34% for Manganese, and 5% of your daily fiber. All for less than 2% of your daily calories! Here in Fairbanks, pineapple isn't exactly cheap (I think it was around $1.90 / pound, which means it's almost $4.00 for a pound of usable fruit), but I think that eating real, fresh food, is worth the money, and adding an occasional pineapple to my diet is a good thing. 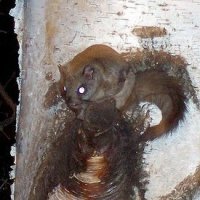 I guess I was wrong about the flying squirrel being disturbed by the boreal owl we had last week. The squirrel has been visiting our feeders regularly since, and we've even seen a pair of them on occasion. 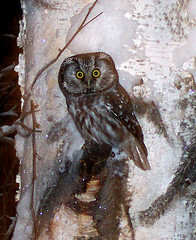 His eyes are actually black, but they're so large that when the flash hits them, they turn completely red. The photo has been edited so they're white instead. My wife took the photo. You can see some more of her pictures at her Flickr page. I'm in the process of making a blank journal book and once it's finished I'll want something to guide my writing. A few weeks ago I saw a posting on moleskinerie about a template based on Robert Bringhurst's great book, The Elements of Typographic Style. 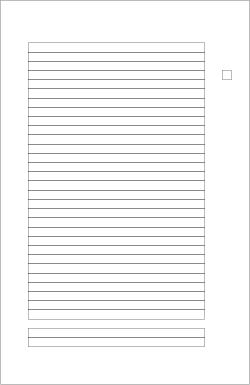 The link led to Rod Graves' blog, where he had a couple PDF templates for a Moleskine journal book. You put the template behind the page you're writing on, and the lines show through the page, helping you stay on course. But my journal book is 5.5 inches wide and 8.5 inches tall, and I wanted to be able to customize the line spacing, and the other proportions mentioned in Bringhurst's book. Such things are easy using Metapost, which is a programming language for drawing, and TeX to place the images on the page. I wrapped the whole thing up with a Python script. creates a template for the journal book I made, saves it as template.pdf and opens it using xpdf. The program requires Python, a basic TeX installation, and the xpdf program, if you want the tempate to be displayed automatically.